Advertise – the Alliance they are a part of. Promote – such as Alaska Airlines promoting Wildlife in Alaska or Continental promoting New York City a few years ago. 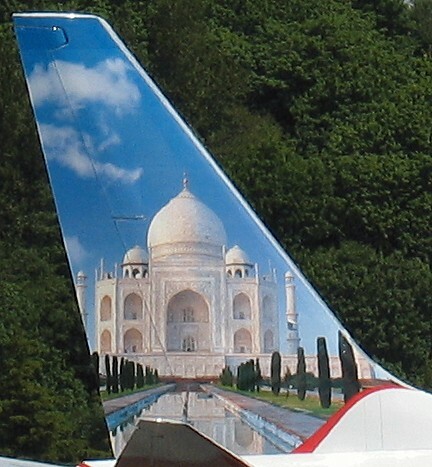 There are many instances of airline painting their aircraft in unique schemes. Southwest has a plane painted up as Shamu the Whale, Alaska Airlines has one painted as a large Salmon fish. If anyone has seen other unique livery, please leave a comment and share. You can get regular updates via email or RSS by clicking on the RSS link here. Do follow us onTwitter and Facebook for updates on Airlines, Airline Miles and other Loyalty Programs. My popular Post on: Airline Elite Status – the What and the How? I recall reading in Lufthansa’s inflight magazine (or similar literature), that for the 2006 FIFA football world cup, LH did something similar, though not as bold as ANA ! They did some research and satisfied themselves that painting the nose of the aircraft wouldn’t harm the radar and other communications. After that, they painted quite a large portion of their aircrafts’ noses in a black and white patchwork to resemble a football ! Eva had 2 “Hello Kitty” Airbus A330-200s with the characters painted on the exterior as well as some extras on the inside. All I remember from the inside was my “Hello Kitty” dessert. Aniruddh, I actually flew in a Lufthansa 747 with the Football (Soccer ball) nose. I wish I had taken a photograph. Kevin, Thanks for sharing the ‘Hello Kitty’ link. Aniruddh, Thanks for sharing the AI Express pictures. I had never seen these aircraft before.